DF 95 For Sale - see details on the 'For Sale/Wanted' page. held on Sunday 24/3/19 at HCMYC together with photos taken of the event. The results, a report and pictures of this event held at HCMYC on Sunday 10/3/19 can be seen by "clicking" on the 'Open Meetings Results' page. Model yachting has taken place on the Rick Pond since 1897. 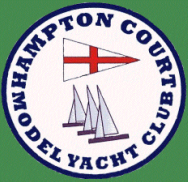 Hampton Court Model Yacht Club is one of the largest and most active clubs in the UK. The Club has its own clubhouse and car park situated near to the Rick Pond. We host events at Local, District and National Levels and sail mainly radio controlled yachts but there is also a keen group sailing vane and vintage boats. We sail 6 different classes - the International One Metre (IOM), the Marblehead (M), the 10 Rater (10R) the A Class (A), the Micro Magic (MM) and the Dragon Flite 95 (DF95). The Club has an enthusiastic membership and promotes friendly and competitive racing which takes place up to 3 times per week throughout the year. You can find us at the Rick Pond from about 10am on Wednesdays, Saturdays and Sundays.